A wiki page about electronic basics. The index of Walt Jung's very good and free book. A very good book about opamps and their applications, a reference. A very well written book about opamps operational amplifiers and their applications. 464 pages loaded with good information, all for free! All sorts of distorsion forms are very well discribed here by Doulgas Self. Mr Self has also written a couple of books in the subject but I haven't read any of them. Beware of the huge page. It takes some time to download. 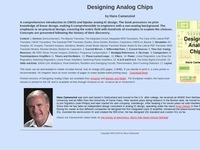 A book for free about analog IC's.